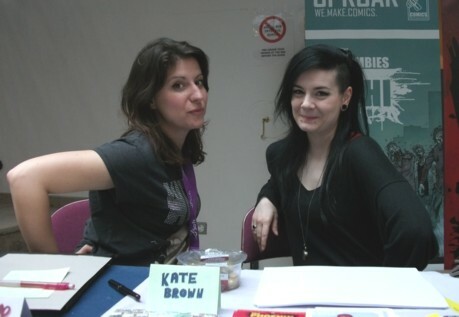 This year's 2D Comics Festival in the UK's 2013 City of Culture, Derry-Londonderry, was the largest comics event ever held in Northern Ireland. With talks and work shops in the days running up to the weekend, the weekend itself had a family friendly cosplay event and a free comics fair during the day at the city's Millennium Forum plus evening talks in Sandino's Bar. Organised as it has been for each year since 2007 by the Verbal Arts Centre (above), it has outgrown the 19th century former school and so this was first year that 2D has moved from its spiritual home, and into the much larger Millennium Forum theatre and conference centre also just within the city's defensive walls. This year the Verbal Arts Centre building was retained for an exhibition of local artist Will Simpson's film and television work including that on the biggest TV series to be filmed in Northern Ireland, Game Of Thrones. The Millennium Forum (below) is a much more modern building with considerably more room to move around and generally be able to breathe. Built to cope with the hilly section of the city where the old wall actually runs beneath a road, the building has multiple levels with the main doors being, disconcertingly, at the top. The main atrium of the building was used for the 2D Comics Fair with tables squeezed into every space, from the entrance hall via various bridges and landings, to the main lower floor and even beyond. The layout of this at first glance seemed a little chaotic but realisation soon dawned that the organisers had blocked certain routes to ensure that everyone walked past all the various tables before arriving at the main floor level. Indeed the various guests were spaced around the building with each area having several guest artists meaning that there really were no sections that could be ignored. And the organisers were not ignoring their guests either with drinks and food being provided and even paper being offered to the artists in case they had run out. 2D has a good reputation amongst its guests and it was not hard to see why. As it was free entry to the Comics Fair, there was a varied cross-section of punters around with, on the Sunday at least, few cosplayers to be seen other than those taking part in the Heroes and Legends event deeper in the building. The city's local creators are Uproar Comics who came together through previous 2Ds and the 2D Collective offshoot. 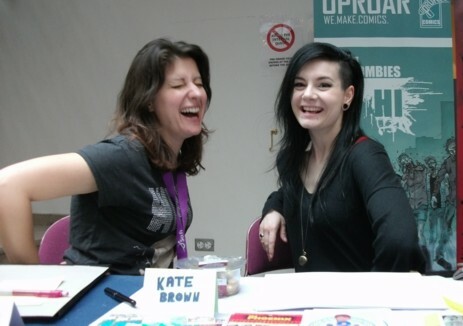 They publish the Zombies Hi title which is an anthology of the main ongoing Zombies Hi story backed up with short zombie text stories and comic strip, and is widely distributed within Northern Ireland. Writer Danny McLaughlin (left) was more than happy to talk about both zombies and their new standalone title, The Ballad of Half Hanged McNaghten, while artist Kevin Logue (right) drew attendees as zombies. There are more details of all Uproar Comics publications on their website. From across the border, and the Atlantic, was Canadian artist and Co Donegal resident Tim Stampton who was displaying some lovely watercolours of folkloric figures which he had combined into a softcover book entitled Irish Faerie Folk. There are more details of Tim Stampton's work on his website. Also from the Republic of Ireland, yet a familiar face at UK conventions, was writer Maura McHugh. As well as books and plays, Maura writes two title's for Dublin's Atomic Diner comics, Roisin Dubh and Jennifer Wilde. 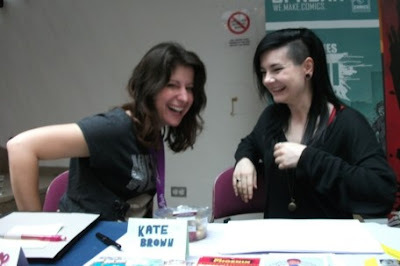 The third and concluding issue of Jennifer Wilde was hot of the presses, as Maura shows above, while the third issue of Roisin Dubh is due imminently. There are more details of all Maura's work on her website which includes her own thoughts on 2D 2013. Back north of the border and Belfast artist Davy Francis who worked on IPC's Monster Fun and Oink as well as a wide variety of Northern Ireland small press zines. Like most of the artists at 2D Davy was providing quick sketches for free and here he provides one young fan with a image of Spiderman. There are more details of Davy Francis' work on the Irish Comics Wiki. Sitting beside Davy was Welsh artist Mike Collins perhaps best known these days for his Doctor Who work including the two Dalek graphic novels published by BBC Books. Here he is sketching an unusual mix of the eleventh Doctor and Dan Dare. There are more details of Mike's work on his website. From Wales to Scotland and artist Gary Erskine who was there with his wife Mhairi Stewart who run workshops under the Perfect Spiral name. One of Gary's latest titles is the fourth Doctor and Leela episode of IDW's Doctor Who: Prisoners Of Time, while his own project, Roller Grrrls, skates closer to publication. There are more details of Gary's work on the Scotch Corner blog and the Perfect Spiral website. Marvel artist Herb Trimpe was a major US guest perhaps best known for his run on The Incredible Hulk during which time he drew the very first appearance of Wolverine in 1974. He was selling original Marvel artwork pages as well as doing sketches. However why ask him to sketch Hulk or Wolverine when he was also the first artist on Captain Britain in Marvel UK's Captain Britain Weekly in October 1976? There are more details of Herb's work on the Marvel Comics Database. ... that set Emma off. Was it something I said? Sorry to disappoint, but I couldn't possibly repeat it - what happens at 2D stays at 2D! There are more details of Emma's work on her website and Kate's work on her website. Yet these photos seem sum up the friendly and fun atmosphere of 2D for both the guests and the punters. That is the sort of atmosphere that organiser David Campbell and his team set out to achieve each year and, once again, in 2013 they have achieved it. 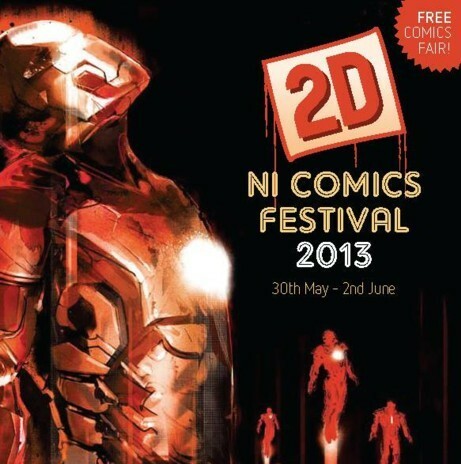 There is more information on 2D, the Northern Ireland Comics Festival, on the the 2D website and Facebook page. Timed to coincide with the release of new Warner Bros film, Man of Steel, the first issue of Titan Comics new Superman is on sale now. Featuring Henry Cavill in the lead role and directed by Zack Snyder, the Man of Steel film will be released in cinemas on 14th June and will be darker in tone than previous incarnations - and so will the Superman comic. 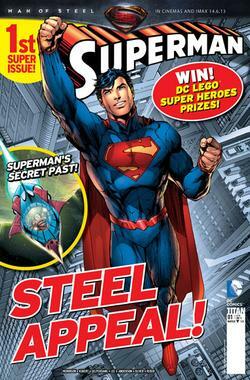 Aimed at 9-17 year old boys, Superman will feature two full full-length, action packed comic strips in every issue. Issue 2 goes on sale at the end of this month. Here's an untold adventure from Superman's very earliest days in Metropolis - learn how he got his name, his crest, and discover the importance of his cape, as you share a day in the City of Tomorrow! Delve into Superman's past as we turn back time to that fateful moment when baby Kal-El was jettisoned from is dying home planet of Krypton! What bigger role does the life-saving rocket that carried him to Earth still have to play in Superman's future? Fan favourite artist Trevor Hairsine is returning to 2000AD next week for the first time in 13 years. 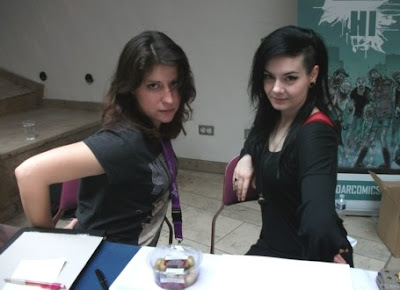 First appearing in the Judge Dredd Megazine in 1994, Hairsine has gone on to become one of the hottest artists in the industry, working on titles such as Cla$$war, Captain America and X-Men. 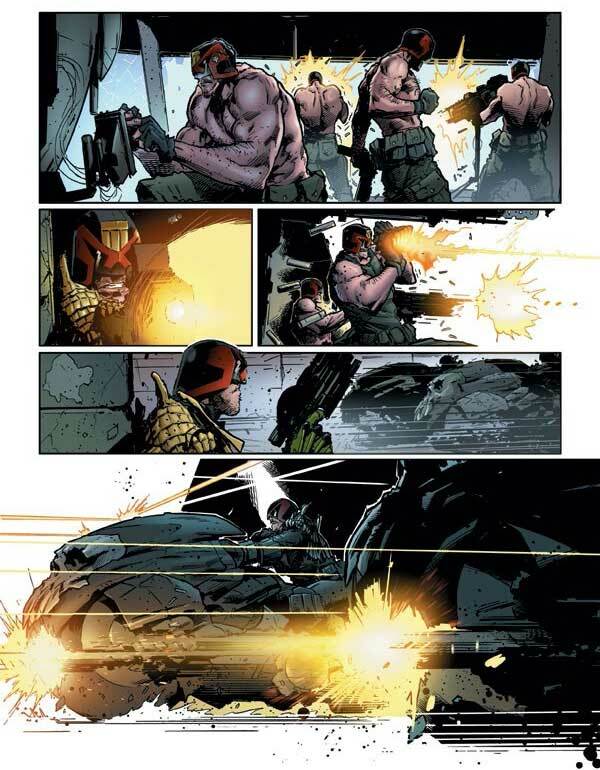 ‘Judge Dredd: Skulls’ in 2000AD Prog 1836, out on Wednesday 12 June, marks his first work for the weekly anthology in more than a decade. Written by Cla$$war collaborator Rob Williams, the one-part story sees the legendary lawman pinned down by a Judge-killing gang of thieves, only to receive help from an unexpected - and unwelcome - quarter. that’s gritty and fun. That’s the appeal, really. “Trev and I have worked together a few times over the years. Most notably on my first ever comic work, Cla$$war. I nagged him to do a Dredd a few times and eventually he caved and agreed. And I’m delighted he did. I got the first page through from him and it just looked right, if you know what I mean. “I think, whether he wants to admit it or not, Dredd’s in his DNA. You can see the hint of Mick McMahon’’s influence in the way he draws the Judges. 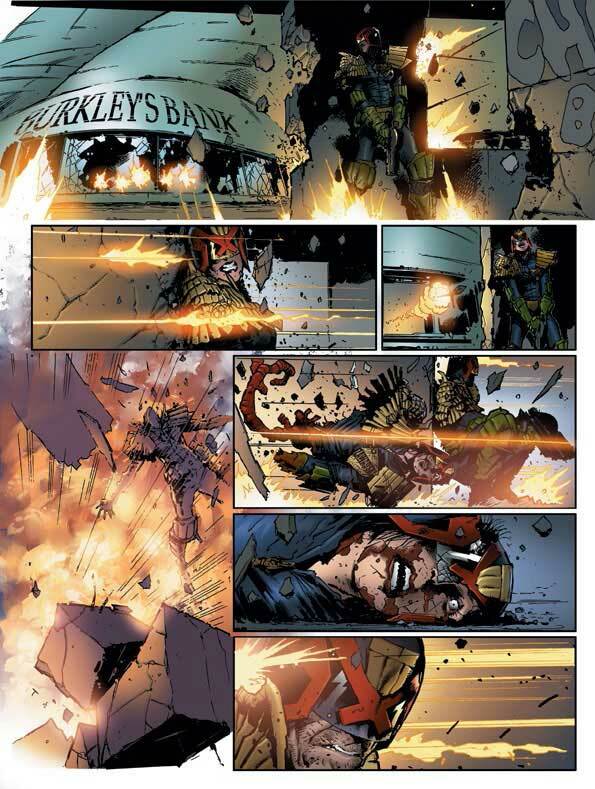 And his Dredd just has the feel of a classic Dredd about it. 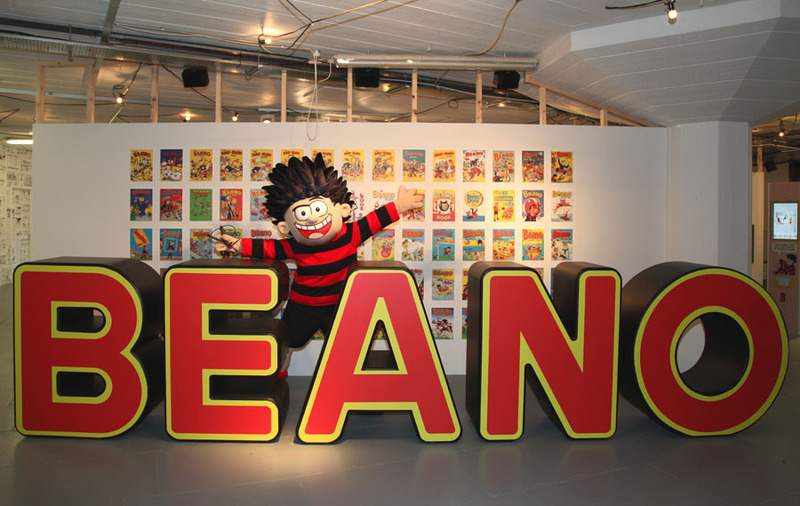 The Beano is celebrating 75 wonderful years of rebellious fun, farts and laughter at Southbank Centre’s Festival of Neighbourhood in London – and you can join in the party at Beanotown, a recreation of the fictional home of the comic’s superstars. The project is part of a collaborative project from Dundee-based publisher DC Thomson, iconic design agency HemingwayDesign and Southbank Centre’s creative team. Previously unseen artwork will be unveiled at the exhibition that features pieces by The Beano illustrator David Sutherland; a legendary artist who has the unique claim of having worked with all six editors since the comic’s birth in 1938. Further laughs and jokes-a-plenty will be provided by clips from the hugely successful TV show Dennis and Gnasher and The Beano’s hilarious iPrank App that will be available to download free in Beanotown – perfect for mega-menacing in the home of prank! Other highlights include The Beano Social Club, where you can play Table Dennis (of course), The Beano Breville Bar, where you can munch on comic-themed food and drink (anyone for a Splat-a-Pult? 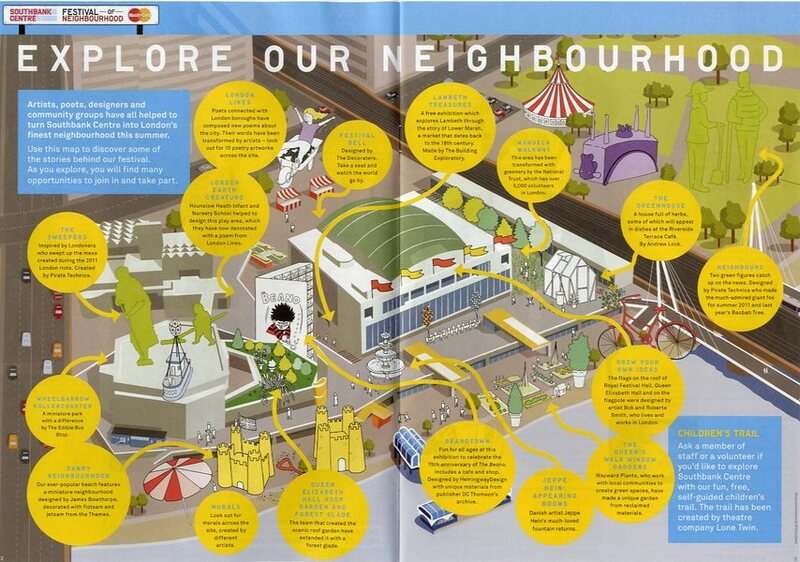 ), and The Beano Studio where you can have a go at creating your own comic masterpieces (if you dare). In July 2013, elements of Beanotown will appear at the Vintage Festival, part of the Merchant City Festival, in Glasgow. “The Beano is a true British institution," enthuses HemingwayDesign’s Wayne Hemingway MBE, who has also recently designed a new style guide for Beano licensors, "and the whole team at HemingwayDesign have had a blast looking through the archive and helping to put Beanotown together. The artwork and stories are wonderful and show how British humour and irreverence can help us get through the toughest of times. The Book: Dan Dare is easily the most famous British comic hero. 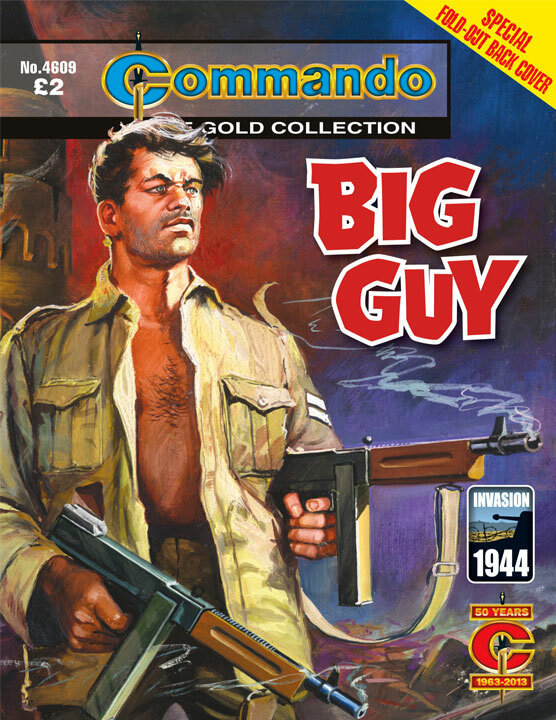 His adventures appeared in the original Eagle comic during the 1950s and 1960s, but he also featured briefly in 2000AD before returning in the re-launched Eagle of the 1980s. This innovative Haynes Manual takes a detailed look inside the spaceships, space stations and various other craft that played such a huge part in bringing the excitement of space travel to the stories. 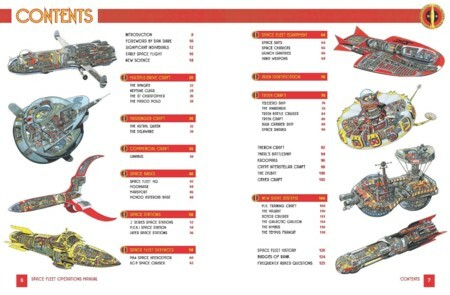 Beautifully illustrated with cutaway artwork by Graham Bleathman, and supported by fabulous contemporary comic-strip art, this is the ultimate technical guide to the spaceships of Dan Dare and a wonderful addition to every comic fan's bookshelf. The Review: Rod Barzilay and Graham Bleathman have brought back the world of the original Dan Dare with a vengeance in this fun collection, delivering not just some great cutaways of the strip's well-loved vehicles and craft, but also making a coherent whole of the original Dare mythos, placing it in its own universe - no easy task given the character's long history. (The modern versions of Dare are not included in this Manual, consigned, perhaps, to other parallel universes). While I'm sure there are Dare enthusiasts out there who will nitpick details of the chronology Barzilay has crafted (I have no idea if any of it is "wrong"), for me, the author has delivered a wonderful guide to a fictional universe, accompanied by some terrific cutaways from Graham Bleathman. While some of the cutaways and art have been previously published (in Spaceship Away) there's plenty that is new to savour, and unlike some Dare-related books, its official status means there's no shortage of art from the comic strip itself included. Back in its day, Eagle regularly published many amazing cutaways of real world ships, planes and other vehicles: it's wonderful to see the most memorable creation of Frank Hampson and his talented team put under a similar microscope in this Haynes Manual. The subject is treated with respect, but in a way that will rekindle an excitement and enthusiasm for the original in fans - and, hopefully, stir the imaginations of those new to the mythos. There have been some who have commented on the format of the book: all the cutaways are printed across double page spreads and there has been some griping at the loss of some detail as a result. But to do as others have suggested - utilising gatefolds and landscape formats - would simply have made this marvellous title overly expensive, a barrier to bringing the world of Dan Dare to a new audience. This is a glorious title, recreating the world of Dan Dare with aplomb. Worth tracking down - before the Mekon buys every copy for his spies! A personal introduction by the Controller of Space Fleet, Dan Dare. A history of spaceflight, propulsion systems and our first steps to the Moon and Mars. Fully detailed and comprehensively annotated cutaway drawings of the principal ISF spaceships, space stations and installations, along with many of the alien craft that Space Fleet has encountered to date, by renowned cutaway artist Graham Bleathman. Profiles of ISF personnel, and the aliens they have faced over the years. Space Fleet history: a guide to ISF’s missions and Dan Dare’s adventures. Based on the classic Dan Dare comic strip that appeared in Eagle magazine during the 1950s and 1960s, this Haynes Manual is fully authorised by the Dan Dare Corporation Limited. In the 1990s Rod Barzilay had the idea to bring Eagle comic’s best known character, Dan Dare, back into print, not updated for a Star Wars audience as in 2000AD or as a political commentary as in Revolver, but rather as the original character read and loved each week in the 1950s by hundreds of thousands of British schoolboys. To remain true to the original Rod decided to approach the original 1950s artists to see if they would be willing to return to the comic strip of their youth. 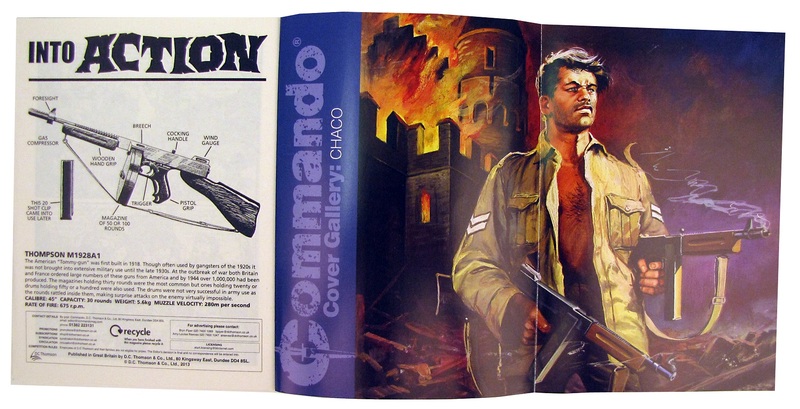 Keith Watson and then Don Harley agreed to this and the magazine Spaceship Away was born. 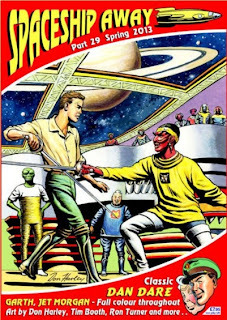 29 issues later, and with many more of the original 1950s and 1960s Dan Dare artists involved along the way, Spaceship Away remains a high quality, full colour, glossy magazine that is published three times a year. So it was no surprise that when Haynes decided to add Dan Dare to their list of science fiction technical manuals that includes Star Wars, Star Trek and Thunderbirds, Rod was the man to write it. 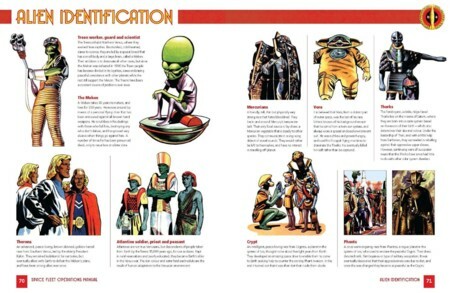 Jeremy Briggs spoke to Rod about this new Dan Dare Spacefleet Operations Manual from Haynes as well as Spaceship Away. downthetubes: When did you first encounter Dan Dare and what made him standout for you amongst the other strips in Eagle? Rod Barzilay: I first saw a copy of Eagle in May 1954, at the tender age of seven. I remember green men caught my attention, the Mekon and his Treens in ‘Prisoners of Space’, and although I liked other Eagle strips as well, the idea of outer space adventures appealed the most. Desmond Walduck was illustrating the strip at this time while the following year Frank Hampson and his team took up the reigns again. To a lad who knew nothing about artists then, the strip just seemed to get better and better until the end of the 1950’s when Dan Dare was updated which was very unsettling to previous readers. Many characters disappeared, equipment and uniforms drastically changed, and continuity with past events was almost totally lost. When the strip went to black and white my interest waned and I stopped taking Eagle at the end of 1963 (mind you I was more interested in girls then!). However, from 1960 onwards I began to chase the early stories I had never seen. It took ten years to fill in all the gaps and when the original Eagle folded in 1969 I also started looking for the later issues to complete the run. 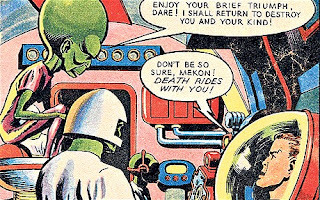 It was only then that I saw some of Keith Watson’s later impressive colour Dan Dare work like ‘All Treens Must Die’. DTT: You began Spaceship Away in 2003 and it is now on its 29th issue. What inspired you start the magazine and how has it changed over the years? Rod: The magazine was started as a means to get new 1950s style Dan Dare stories in print for the fans who longed for the original Dan Dare to be revived. Although Dan Dare is the main focus of Spaceship Away, from issue seven we started adding other sci-fi strips as well, including Charles Chilton’s Journey Into Space reprinted from Express Weekly with artwork by Ferdinando Tacconi, and Sydney Jordan’s “Hal Starr” reprinted from the Dutch comic Eppo and its first time being published in English. Later on we added Ron Turner’s “Nick Hazard”, John Freeman and Mike Nicoll’s “Ex Astris” and eventually the Daily Mirror’s “Garth” with art by Frank Bellamy and Martin Asbury. DTT: Where did the idea for the Haynes Dan Dare manual come from, did you approach them or did they approach you? Rod: I believe Graham gave Haynes the idea to do a Dan Dare book, along with the suggestion that I could write it. He did bounce the idea off me and I was up for it. As Dan Dare has gone through so many changes over the years we decided to just stick with the original up until the point when Dan was made controller of Space Fleet. This was the period I knew the best and when the strip had the most interesting technology and ideas. The book took about six months to write and I was tweaking stuff right up until it went to the printers at the end of March. Some sections were rewritten when I reread the old stories again and spotted some references that I had miss-remembered, or forgotten about. Also as some information in Eagle had no reference time-line, or was at odds with earlier stuff printed in the strip or elsewhere, this did present some problems, and I had to work it all in somehow. No doubt I’ll get some interesting feedback on my solutions! I would have liked to have expanded some areas of the book had there been more space. Let’s hope nothing important got passed over – no doubt fans will let me know if that is the case! DTT: How did you and Graham decide on what to feature in the manual? For instance how did you choose the Spacefleet theme rather than feature any spaceships that were in the Dan Dare strips? Rod: The idea was that when Dan became controller of Space Fleet, he commissioned a manual for new recruits. This would not only give an outline of Space Fleet’s history so far, but would also include details of any craft or equipment they could encounter, be it older Space Fleet craft possibly lost in space, or alien ones that had already turned up in the Solar System and might reappear again someday - forewarned is forearmed. We investigate different drive technologies that Space Fleet has tried out, and alien ones it has encountered. There is a good look at lots of Treen spacecraft including the M.E.K.1 space station, and other important alien craft too, like Tharl’s Battleship, Black Cats, the Crypt inter-star ship, and the Zylbat. We also have notes on Theron, Cosmobe, Pescod, Nav, Triton, Pittar, and Krevvid spaceships, plus some unidentified ones that turn up in the saga as well. 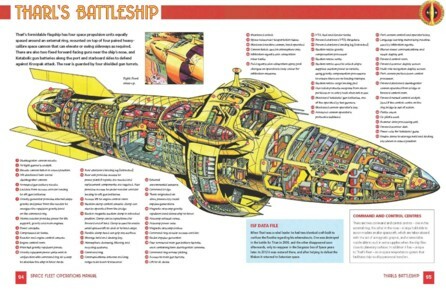 DTT: Artist Graham Bleathman has provided cutaways for Spaceship Away in the past. How much interaction did you have with him over the details of the interiors of the ships and other vehicles featured in the book? Rod: We both have extensive Eagle collections, which are rich in background details of spaceships and equipment, and did compare notes from time to time, talking over things not fully covered. Two spacecraft, the Marco Polo and the Delaware, were drawn up from my notes and designs in the comic strips in Spaceship Away, but it is Graham’s genius that brings them all to life in such fine cutaway detail. However, Eagle and related publications are a bit thin on the ground with details of Space Fleets early history so I expanded this area taking into account ideas put forward by other fans over the years. DTT: If the manual is successful enough to warrant a sequel, are there other aspects of the Dan Dare universe that could be featured in a second book? Rod: Oh yes – we could do a book on all the alien worlds that Dan Dare visited, looking at everything found there, futuristic cities, novel equipment, robots, other spacecraft and strange transport etc – not only in the Solar System, but further afield as well. Venus, Mercury and the Moons of Saturnia are rich in things to have a closer look at, as are planets in other star systems such as Cryptos, Phantos, Terra Nova, Zyl, Platinum Planet, Moss, for example. It would be great fun to do. DTT: Rod, thanks for taking the time to talk to us. • There are more details of Graham Bleathman's work on his website. The Beano is letting loose Dennis the Menace’s trusty sidekick Gnasher, to raise funds for the Bristol Children’s Hospital this summer, as the famous cartoon dog joins forces with Aardman’s triple Oscar-winning character Gromit, for charity initiative Gromit Unleashed. Extracts of original Beano artwork featuring Dennis and Gnasher have transformed a giant five foot high Gromit sculpture that will feature as part of a high profile public arts trail, hitting the streets of Bristol and beyond for ten weeks from Monday 1st July. The Beano’s ‘Gnashional Gromit’ is one of 80 giant Gromit sculptures to be featured in the ground-breaking Gromit Unleashed event, organised by Aardman and the children’s hospital charity, Wallace & Gromit’s Grand Appeal. The cartoon design has been created by the team behind The Beano, led by Editor-in-Chief Mike Stirling and legendary artist David Sutherland. David was the Dennis the Menace artist from 1969-1998 and it was he who gave Gnasher his trademark look. In his career, he has also drawn other legendary Beano characters, including Biffo the Bear and The Bash Street Kids, for whom he has now drawn a whopping 2180 weekly comic strips – a unique achievement in the cartoon world. He has also worked with all six editors of The Beano. 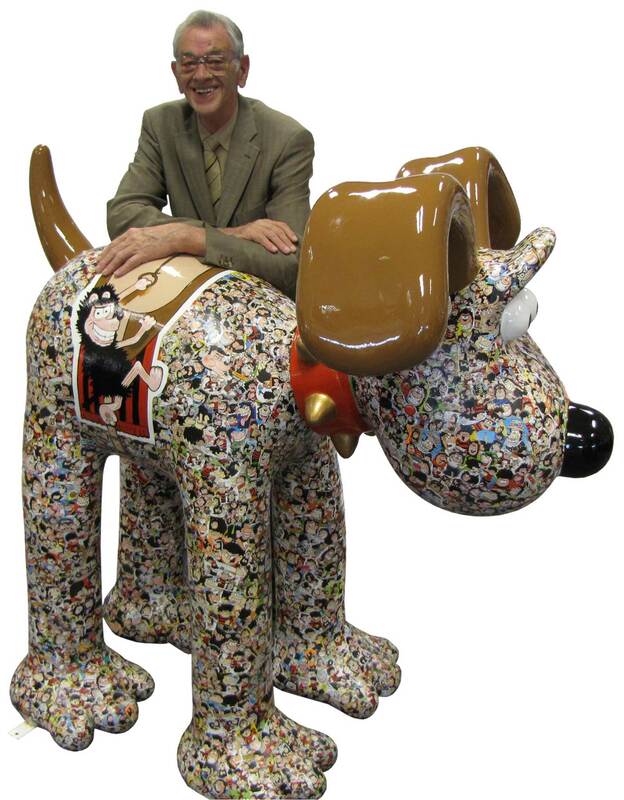 Gromit’s creator Nick Park grew up an avid reader of The Beano and is a massive fan of David’s work, attributing him as a major influence at Aardman and an early inspiration for himself. At 10 years old, smitten by the characters in the comic, Nick Park started drawing his own cartoon strip, which led to the creation of Wallace & Gromit. Nick Park said: “As a life-long fan of The Beano, I am thrilled that Gromit and Gnasher, two of the world’s most iconic canine characters, are getting together. To have Gromit receive a Gnasher makeover from the comic which inspired Gromit’s creation is pretty amazing! Nick Park guest-edited the 70th anniversary issue of The Beano, which this year celebrates 75 years in production. The Beano joins a prestigious line-up of famous names including Nick Park, Sir Quentin Blake, Raymond Briggs, Cath Kidston, Sir Paul Smith and Harry Hill, each transforming the five foot statues with their individual designs, alongside local artists from the Bristol area. Organisers will be revealing further famous names and unveiling more finished designs in the lead up to the public arts trail. After the public arts trail, the Gromit Unleashed sculptures, which have been individually sponsored by businesses, will be auctioned to raise funds towards Wallace & Gromit’s Grand Appeal’s campaign to support the expansion of Bristol Children’s Hospital, one of the leading multi-disciplinary children’s hospitals in the UK. The Grand Appeal has pledged to raise an initial £3.5 million for state-of-the-art equipment, including an intraoperative MRI scanner, family facilities and child-friendly artwork to enhance the £30 million investment by the NHS. The Grand Appeal is working with Wild in Art, a leading arts and education company that produces mass participation events in cities, to deliver Gromit Unleashed. Wallace & Gromit’s Grand Appeal has already raised over £22 million for Bristol Children's Hospital, one of only a few specialist children's hospitals in the UK providing life-saving surgery, care and treatment to children on a local, national and international scale. With the support of tourism agencies VisitEngland and Destination Bristol, Gromit Unleashed will help raise the profile of the city to tourists across the UK and beyond. • For more information and the latest news on the project, visit www.gromitunleashed.org.uk. 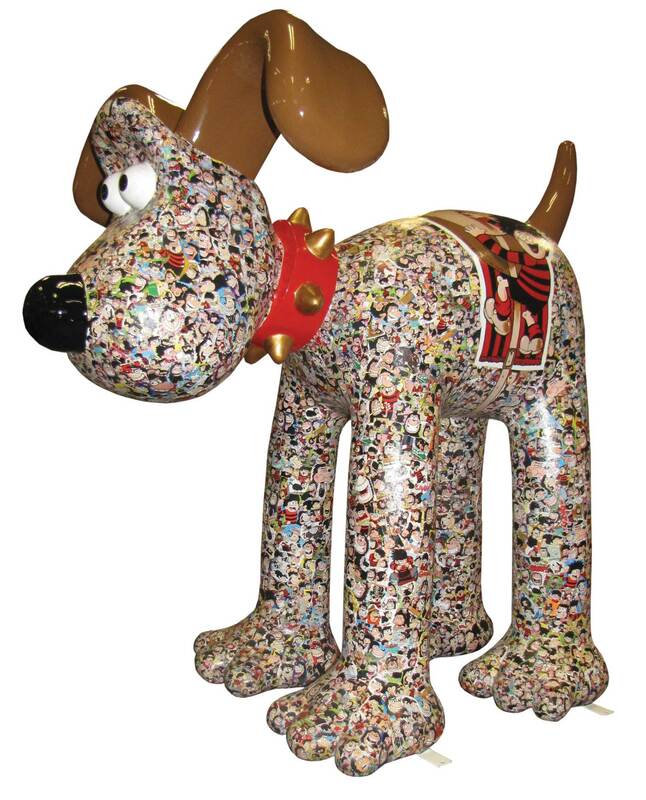 To register your interest in bidding, please email auction@gromitunleashed.org.uk. • For information on events and activities taking place in Bristol during Gromit Unleashed, plus details on accommodation options in the city, visit www.visitbristol.co.uk. For most comics readers Graham Bleathman's name is synonymous with large detailed cutaway paintings of buildings, vehicles and flying craft both real and fictional. It was not surprising then that he is now the artist behind four of the new series of Haynes Workshop Manuals that feature fictional vehicles rather that the real cars that the publisher is best known for. The latest of these is the Dan Dare Spacefleet Operations Manual which has just been published. 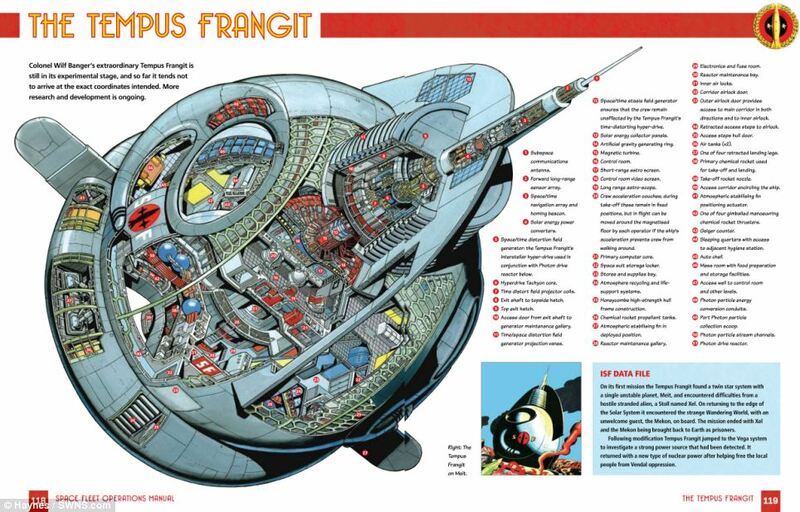 Jeremy Briggs spoke to Graham about these new Dan Dare cutaways as well as the rest of his work. 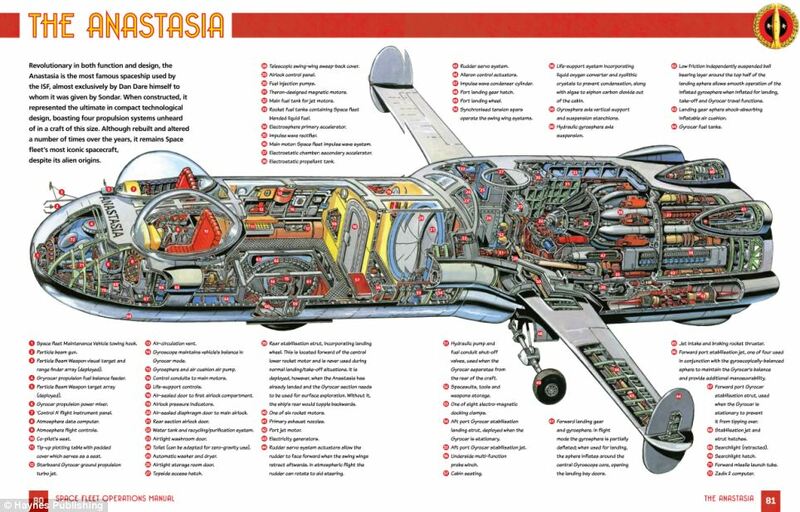 downthetubes: You are perhaps best known for your detailed cutaways of Gerry Anderson craft from TV series such as Thunderbirds, Stingray and Captain Scarlet published in the various 1990s comics that covered those series and the large format hardback cutaway books that followed. When did your love of cutaways begin and did you set out to be a cutaway artist? 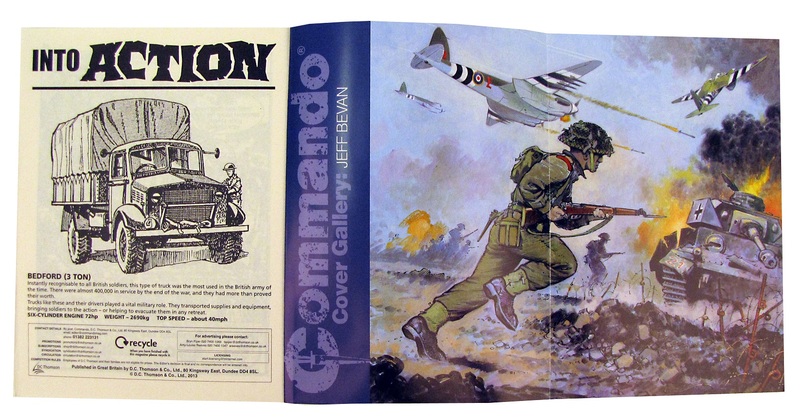 Graham Bleathman: I first came across cutaway illustrations in the TV21 (and related) annuals that I picked up mainly second hand in the early 70s. A handful of cutaways also appeared in TV21 itself, which I also started to collect at around the same time that I was buying Countdown every week. I never bought (or had bought for me) TV21 when it first came out, so I relied on second hand and charity shops in the early 70s, along with jumble and ‘bring and buy’ sales, where in those days comics like TV21 and Eagle could still be found reasonably easily. It was at these sort of events that I found my first few copies of Eagle, and was of course somewhat taken with the centrespread cutaways as well as the more well known strips like 'Dan Dare' and 'Heros the Spartan'. I don’t think I set out specifically to become a cutaway artist; it just sort of happened after I left college. During my time at Exeter College of art, I painted a cutaway of Exeter Cathedral, which was followed a year or two later by cutaways of Salisbury Cathedral and a few other buildings which were commissioned by the Salisbury Journal newspaper. 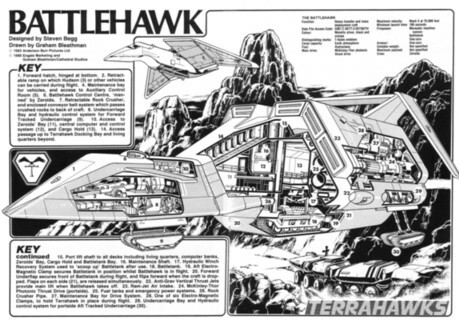 I was also involved in the Gerry Anderson fanzine SIG at the time, and I produced my first Anderson cutaway for that, which was a black and white illustration of the Battlehawk (SIG issue 15, Spring 1986), from the then current Anderson production Terrahawks. 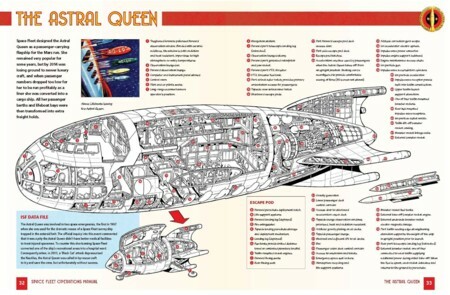 DTT: Other than the many Anderson cutaways and the Haynes Manuals, what else have you worked on? A few real world illustrations have been drawn too in more recent years, such as cutaways for the now defunct RAF Magazine, Radio Times and a few books. I also have a ‘secret life’ doing the covers for DC Thomson’s ‘People’s Friend’! Under the name ‘J Campbell Kerr’, a team of artists has painted the landscape illustrations on the covers of the magazine since 1946. I started around 7 or 8 years ago (although I did do a brief stint in the mid 1990s) and, since the death of cover artist Douglas Phillips last year, I now paint around half of them on average. I have no idea why the 'J Campbell Kerr’ name has been used all these years; no one seems to know the its origins, and nobody wants to break with tradition! 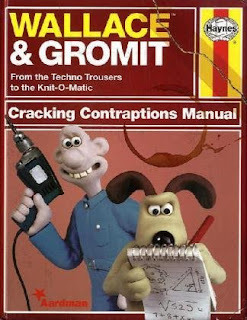 DTT: Your work for Haynes began with the first of the Wallace and Gromit Haynes manuals, Cracking Contraptions, a book that sold so quickly that it had to be reprinted almost immediately it was published and has since gone to a third printing. 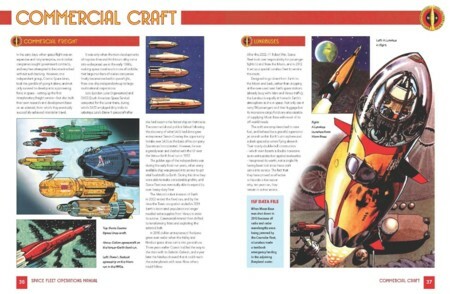 After your second Wallace and Gromit book you moved on to the Thunderbirds Haynes manual which, given your artistic background seems an obvious choice, and now the new Dan Dare manual. Where did your interest in Dan Dare stem from and how did the Haynes manual come about? Graham: My interest In Dan Dare originates through TV21; many of the artists on TV21 were poached from Eagle, and I began to notice the work of Frank Bellamy and others in Eagle as I started to pick up second hand copies. The Dan Dare stories seemed to have parallels with many of the concepts seen in the Anderson shows (particularly the way they were developed in TV21), such as a World Government and a (generally speaking) optimistic view of the future. I became involved with Haynes when by bizarre coincidence both myself and the writer of the Thunderbirds manual (Sam Denham, with whom I have worked before on a couple of books) approached Haynes separately with a view to doing a Manual based on that series. 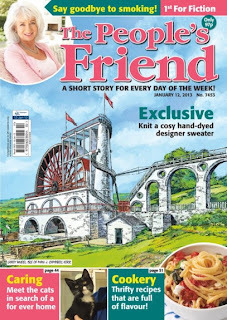 Initially, Haynes weren’t too keen, but as they were moving into doing manuals based on fictional subjects anyway, they offered me the job of illustrating two Wallace and Gromit manuals instead, having seen my Thunderbirds artwork and in particular a Wallace and Gromit cutaway (of Wallace’s house) for the Bristol Evening Post. The Thunderbirds manual was therefore put on hold for 18 months or so. The success of the Wallace and Gromit manuals prompted Haynes to proceed with the Thunderbirds edition, and that has proved successful enough for them to commission something I had also thought about for a couple of years, Dan Dare. That book is now complete and I have returned to the Anderson world with another manual with Sam Denham to be published next year. DTT: The writer of the Haynes manual, Rod Barzilay, is a familiar name to Dan Dare fans due to him creating and editing the long running Dan Dare magazine Spaceship Away. How did Rod come aboard and how did the pair of you sort out which spacecraft and other Dan Dare vehicles to feature in the book? Graham: I knew Rod from Spaceship Away magazine, having initially met him at a Dan Dare ‘Open Day’ at an exhibition in Bristol a few years ago, at which Eagle and TV21/Countdown artist Don Harley was also present. I have since drawn around 10 or so cutaways of Dan Dare spacecraft (and real world locations such as the artists’ studios in Southport and Epsom), for SA over the years, and Rod’s knowledge of Dan Dare’s ‘fictional’ history made him ideally placed to supply the basic text of the book and provide the expert knowledge that I lacked; I almost got the impression that the future history of the Dan Dare universe was more real to Rod than our own! This meant that he could concentrate on Space Fleet’s history and characters leaving me to deal with the artwork and technical bits. His comprehensive knowledge was ideal for me to bounce ideas from, with comments like ‘Space Fleet wouldn’t use that sort of space drive until such and such a date’, etc! We also selected the ships and locations on the basis of how important (Rod in particular) thought they were important to the Dan Dare history. I’m sure a few favourites will have been missed out, but with around 45 cutaways and illustrations in the book (not to mention lots of Eagle frames and other new artwork), I hope most people will be pleased with the results. DTT: Those Dan Dare craft, along with the majority of the fictional vehicles you have painted cutaways of, were never created to be analysed in the sort of detail your work requires. How much of any given cutaway is 'creative engineering' on your part and do you have any background in the technical drawing of engineering subjects to help you fill in the gaps that the original artist's imagination did not need to show? Graham: There is a fair bit of ‘creative engineering’ in the Dan Dare book in particular, although as much applies to the Anderson subjects as well (and especially Wallace and Gromit!). For Dan Dare, the main problems are visual inconsistencies between instalments, and often from frame to frame. After all, apart from the Anastasia and a handful of other cutaways, no-one at the time gave too much thought about how the ships worked or whether the details altered from frame to frame. In the 1950s, some effort was made to keep things consistent with the use of studio models and endless photographs, but no-one had time to ensure that fine detail (the detail that I would need years later, anyway!) remained true through all the stories. In terms of scientific accuracy, the technology seen in the strip has not been seriously updated, although a couple of aspects such as radiation proofing in spacecraft and spacesuits and polarised heat resistant windows on spacecraft (for example) do get a mention every now and then. I don’t have a scientific background, nor do I have a background in technical drawing either, so it does seem a little odd to many people that the one thing I’m well known for are cutaways of vehicles, locations and spacecraft, both real and imagined! DTT: The diversity of your cutaway subjects is remarkable, from the Eurofighter Typhoon fighter/bomber for RAF Magazine to Holby City Hospital for the Radio Times, from Thunderbird 2 for Thunderbirds The Comic to the Precinct House space station for Space Precinct magazine, there must be few types of vehicles or constructions that you haven't covered. Which of these has provided you with the greatest challenge to depict and which, of all of them, is your own favourite of your work. Graham: The cutaway that gave me most problems was one of Wallace’s ‘cracking contraptions’ from the one of the Wallace and Gromit Manuals. It was a device for changing channels on a TV set that involved cogs and catapults in true Wallace tradition (as opposed to a simple remote control). Unfortunately, there was no visual consistency from shot to shot when watching the contraption in action on TV, and the solution I came up with was the only one that Aardman didn’t like. A compromise of sorts was reached, although the result isn’t terribly satisfactory. I guess the makers of said sequence weren’t really expecting some poor sod to try and make sense of it a few years afterwards; the contraption and the short film in which it was featured was created for a laugh, after all. 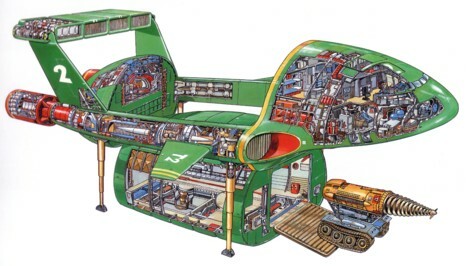 My favourite cutaway? Probably the Thunderbird 2 I painted for the Thunderbirds FAB Cross Sections book published by Carlton in 2000. DTT: Thanks for taking the time to talk to us Graham. There are more details of Graham Bleathman's work on his website. There are more details of the Dan Dare Spacefleet Operations Manual on the Haynes website. There are more details of Spaceship Away on the magazine's website and Facebook page. I'm pleased to report that the main downthetubes.net British comics news and views site is back up and running after a temporary hiatus - and will now be the main point of focus for our delivering of British comic news and views, alongside our forum. There's been a major design change to the site, which is very much a work in progress and there have been a few hiccups transferring stories from this blog to the new site. My apologies to contributors whose credits have vanished in the transition, I'm trying to restore them. The old DTT site is also nestling in the background here - some pages might be missing a few images due to moving this site to new servers and locations, but the text and interviews are all there for you to enjoy. The aim is to slowly incorporate these into the new site over time. (Please bear in mind we do DTT in what spare time we have outside of our day jobs). Thanks to everyone who offered us help to keep on publishing and also made kind donations that helped tremendously enable in the move to a new service. This News Blog - http://downthetubescomics.blogspot.co.uk - is still being updated for now, until we've got the hang of our new format and interface, so news is being posted here and on the main site. DC Comics vamps up its digital titles, will British publishers follow their lead? DC Entertainment has just unveiled two new digital innovations today that the company says will take its comics to "the next level of interactivity" - DC2, a new initiative that layers dynamic artwork onto digital comic panels, adding a new level of dimension to digital storytelling. DC2 Multiverse technology allows readers to determine a specific story outcome by selecting individual characters, storylines and plot developments while reading the comic, meaning one chapter of a digital comic has dozens of possible story outcomes. You have to wonder just how much all this interactivity costs - and what the endgame is, in terms of hoped-for sales and response. 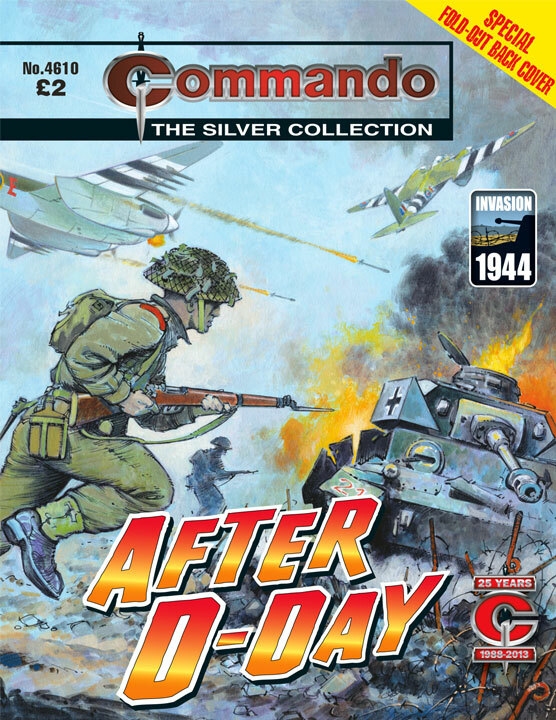 Many British comic publishers have yet to make bring any significant additional content to their digital offerings to really exploit the digital platform, although ROK Comics - which only publishes digitally - has included audio on all its titles, which has received acclaim from a number of quarters outside the comics industry. The Phoenix Comic app is great, but there's as yet few 'extras' to its digital version that might give it even more of a buzz among its gadget-hungry target audience. 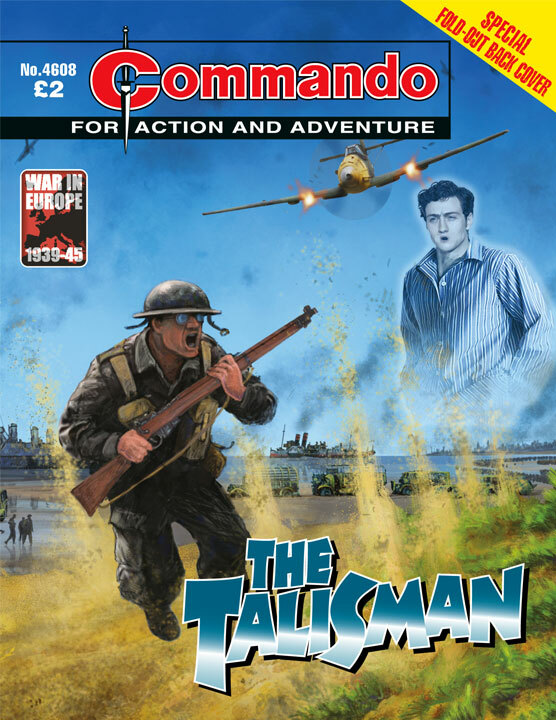 DC Thomson are working hard to make the most of what can be done digitally with their digital Dandy, and their electronic offerings of Commando make good combined use of both the releases and a fantastic official web site to promote the recently-revamped title. (Declaration: I work for ROK Comics). DC Entertainment President Diane Nelson and Co-Publisher Jim Lee unveiled DC2 and DC2 Multiverse at the opening of Time Warner’s “The Future of Storytelling” exhibition at the Time Warner Medialab in New York. 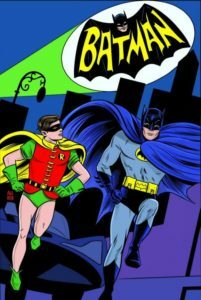 DC2 will first appear in the highly-anticipated new Digital-First title Batman ’66, based on the popular 1960s television show, and the dynamic artwork features will bring the show’s action and retro attitude to life for comic readers. Readers will experience an expanded storytelling canvas as each comic panel tells a multi-dimensional story through layered artwork and sequences. Digital-First title Batman: Arkham Origins, based on the upcoming video game from Warner Bros. Interactive Entertainment, will be the first to showcase DC2 Multiverse. DC2 Multiverse features dynamic artwork, along with action sounds and the ability to integrate a soundtrack – all while allowing readers to determine the fate of each storyline and character, including Super Heroes and Super Villains, with multiple options and end results available in each comic chapter. 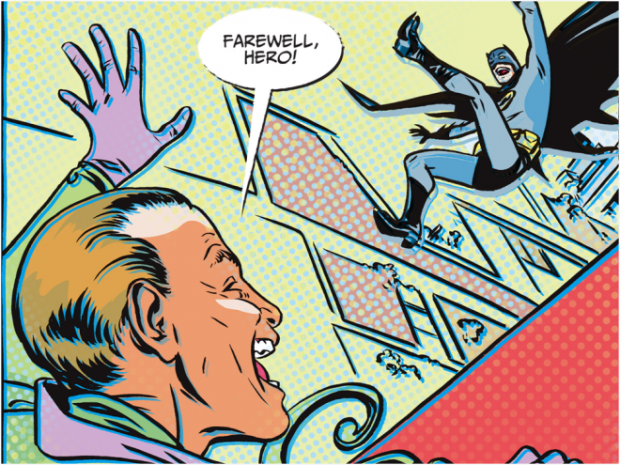 Only with DC Comics’ compelling rogues gallery will fans be just as excited to see what happens to Black Mask as they are to follow Batman’s adventures. In addition to offering its Same-Day-Digital print line-up, DC Entertainment’s line-up of Digital-First titles includes Injustice: Gods Among Us, Adventures of Superman, Arrow, Legends of the Dark Knight, Smallville: Season 11, the Beyond series, Batman: Li'l Gotham and upcoming titles Batman ’66 and Batman: Arkham Origins. Additionally, last year DC Entertainment secured the most expansive digital distribution of all comic publishers by forging new deals with Kindle Store, iBookstore and Nook Store, in addition to its previous distribution on all comiXology platforms. 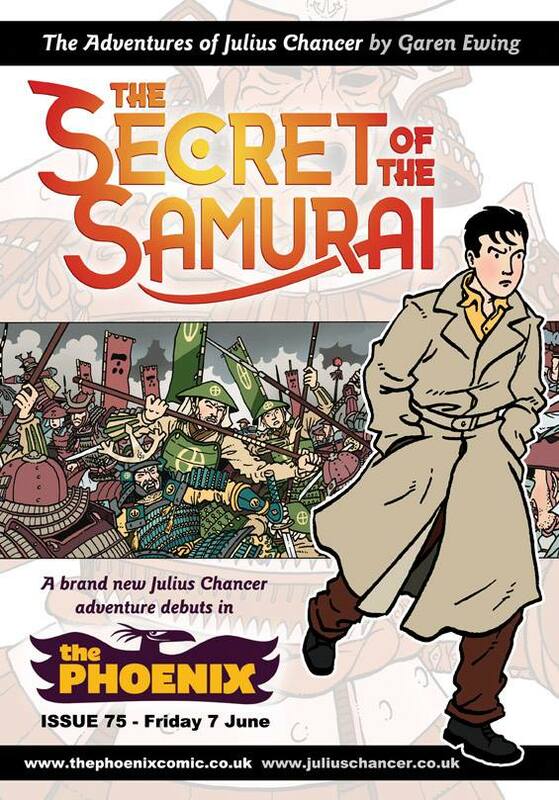 Artist and writer Garen Ewing’s latest adventure of Julius Chancer, The Secret of the Samurai, a prequel to his three book Rainbow Orchid saga, is starting a four week run in The Phoenix beginning this weekend. The twenty page adventure will be published in five page segments over four weeks beginning in issue 75 due on Friday 7 June and concluding in issue 78 due on Friday 28 June 2013. Despite recently becoming a father for the second time, Garen continues to attend conventions. He will be attending Stripped, the comics ‘festival within a festival’ at this year’s Edinburgh International Book Festival, where he will be taking part in three events on Sunday 25 August 2013. The full programme for the Edinburgh International Book Festival and Stripped will be announced on 20 June on the BookFest website. In addition, over the weekend of 19-20 October 2013, Garen will be selling, signing and sketching at the Lakes International Comic Art Festival’s Comic Clock Tower in Kendal in the Lake District. • There are more details of all Garen Ewing’s work on his website and more details on The Secret of the Samurai and The Rainbow Orchid on his Adventures Of Julius Chancer website. • The Phoenix comic is available from Waitrose supermarkets, Travelling Man and Forbidden Planet International stores, as well as a selection of other comics shops and book shops around the UK. • There is more information about The Phoenix on the title’s website including a location guide to stores that sell it. Subscriptions and back issues are also available for those who do not have a local stockist. 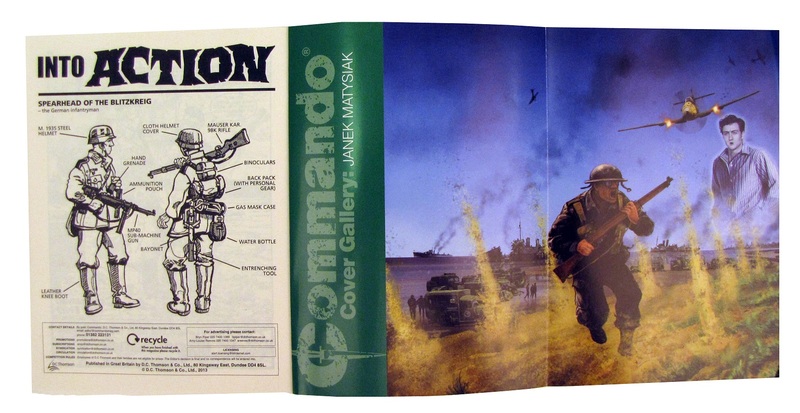 It's all change for Commando as DC Thomson unveil the first set to feature new-style gatefold-out covers. 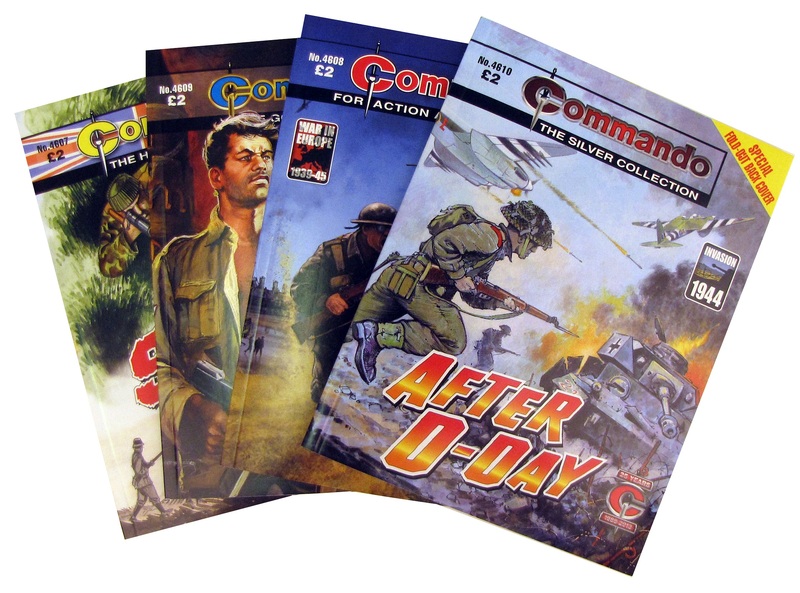 "Over the last two years we've been listening to our readers’ thoughts about Commando and working to make the comic the best we can for them," explains Calum Laird. "We started the Gold and Silver Collections, digging deep into our archive for the very best classic stories — because they asked us to — and these have proved to be winners. "We started our By Special Request series to give all readers, even lapsed ones, a chance to nominate titles they wanted to see again — because they asked us to. Judging by the number of requests we get every week, they like this idea. "We moved to better, cleaner, heavier papers to show off our artwork better — because they asked us to. Okay, they take up more space on the bookshelf but that better quality is worth the extra footage. 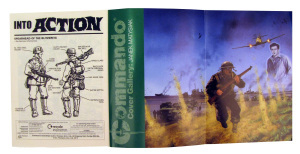 "Now, we've managed to go a step further with the first major change to the Commando format since 1961. The issues released this week (in the UK — sorry, overseas readers, you’ll have to wait a little longer) we’ve added a bit extra to the back covers so that we can display our cover art just as in left the illustrators’ drawing boards. No lettering, no badges, no Commando label. "Why? Because all the readers who have attended our recent exhibitions told us they really wanted to see it like that. 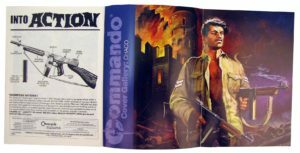 "There are more changes to come in the near future, ones that we know will go down well (because the readers have already told us that they will)," says Calum, "and that will give you more reasons to keep Commando at the top of your reading list." Sniper. The very word struck fear into the hearts of many an infantryman. The thought that a calculating killer could be lying in wait, hidden from view and able to snuff out a life with a single shot, kept men awake at night. Corporal Alec Knight was a sniper, a man of few words and a crack shot. But was he a cold-hearted killing machine? Between these covers is his story. Private Bill Watkins was one of the men who survived the retreat to Dunkirk. He put it down to one unusual incident - the sight of a young French lad spurring him on to reach the safety of an escaping ship when he had all-but given up. Bill decided this youngster was his “Talisman” - his lucky mascot. But was it wise for him to think that a lucky mascot could get him safely through the war? Probably not… especially when he joined the SAS! “Powerhouse” Jenkins was a born fighter. His only trouble was he didn't care who he fought. Germans and British alike crumpled before his massive fists, and this got him into a lot of hot water with the MPs. When his regiment stormed up the French beaches on D-Day there was a song in Powerhouse's heart. For this was the biggest fight he'd ever been in and he was going to enjoy every minute of it. But as things turned out Powerhouse was promoted to corporal for bravery on the field of battle. And according to his sergeant that meant he was a King's Corporal and couldn't be disciplined ever again…So it was that Powerhouse set out to enjoy himself in his own tough way. 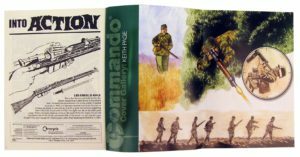 “The earliest Commando stories are peppered with two-fisted characters whose answer to every problem was to wade in with punches flying in all directions,” notes editor Calum Laird of this re-presented tale. “This story from Eric Hebden is no exception but there's a twist. A twist based around something only an old soldier would know about. A soldier like Major Hebden. His touch of authenticity lifts the story right up. “He's ably abetted by Castro whose strong black and white work captures the action beautifully. And what about Chaco's cover? Would you mess with that man? Sergeant Jack Potter had been in the war from the start. A brave bloke, full of courage and common sense. His men knew they could trust him to see them right as they pushed their way forward into France. Then suddenly all that changed. Jack seemed to have something on his mind, something that was more important than anything else - the safety of a man who was no use to anybody! “Here's a solid tale of honour, betrayal and redemption from author Ken Gentry, illustrated to the usual high standard by one of Commando's most prolific interior artists -Gordon Livingstone,” enthuses Scott Montgomery. “As a young reader many years ago, I'd always admired Gordon's distinctive linework. 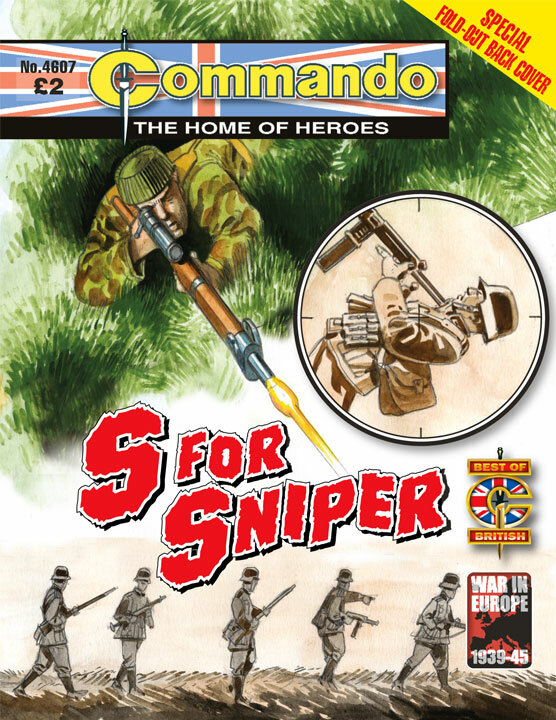 Yet I never even knew his name until I joined the Commando staff decades later!